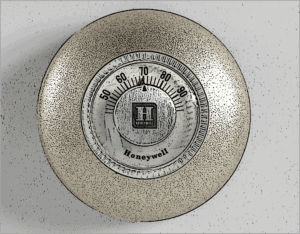 the thermostat is a simple device that many get wrong. It is incomprehensible to me the number of people who do not understand the concept of a thermostat. Even people who should know what it is and how it works don’t understand it. I’ve witnessed first hand, architects, engineers, and scientists ride room thermostats like a volume knob. Answer the following true or false. My car heats up faster in the morning if I turn the thermostat to the highest setting. My house heats up faster if I turn my home thermostat to the highest setting. My refrigerator will get colder faster if I turn my thermostat to the lowest possible setting. My home air conditioning system will cool my home faster if I set my thermostat to the lowest setting. If you answered true to any of the above questions, consider yourself a thermostat moron. The irony is that a thermostat is the simplest of devices. You set it to the temperature you want your heating or air conditioning system to “maintain”, and then forget it. That’s it; that’s all there is. There is nothing else to think about. Yet the world is full of thermostat jockeys, constantly riding the setting in the hope of immediate gratification. They want what they want, and they want it now. If they’re cold, they turn it up, if they’re warm, they turn it down. They are constantly checking it to see if somehow it changed by magical powers. Let me explain the concept of home thermodynamics. Your furnace (or air conditioner) has only one speed – full blast, pedal to the metal, as fast as it can go. It’s a binary system; it’s on, all the way, or it’s off all the way. There is no question of degree. Your thermostat is not a gas pedal. It doesn’t increase the “speed” at which your heater or air conditioner works. What your thermostat does is set a threshold point. That is to say, it sets the “finish line” that your heater or air conditioner is racing toward at full speed. When your heater or air conditioner reaches that threshold it stops. When the temperature drops a few degrees (usually about three) below that threshold, the heater or air conditioner starts again at full speed and continues to run until it reaches the threshold again. The process continues indefinitely, and thereby holds the room at a relatively constant temperature (within a few degrees). A three-degree room variance is normal. If there was no variance, the heater or air conditioner would be “kicking on and off” constantly trying to maintain the threshold to within a fraction of a degree. Since the unit must run for a few seconds to achieve maximum efficiency, this would result in much higher gas and electricity bills. So to achieve the best efficiency, we must tolerate a small variance in room temperature. Unfortunately, the world is filled with those who believe that a temperature utopia is an option. They don’t understand the concept of a room temperature variance (or the concept of a sweater for that matter). At the first sign of discomfort, they adjust the thermostat in an imbecilic attempt to “fine tune” the variance out to the room. What results from this fool’s errand, is a content adjustment and readjustment of a device that needs no adjustment. Finally, the thermodynamically challenged individual leaves the room, office, etc., leaving others to suffer from an ill-adjusted thermostat! Worse, are those who don’t understand that a given temperature feels different to an individual from day to day. Many factors influence how a temperature “feels” to an individual. The ambient temperature outside, moisture in the air, an individuals health, the presence or absence of a menstrual period, etc. all affect the way we feel about temperature. But it’s not fair to impose your personal “feeling” about the temperature on others occupying the same space. The may, and often do feel differently. Thermostats don’t lie. A temperature setting is an unbiased, empirical fact. Leave it alone! For the love of all thing good and decent, set it and forget it! Then go buy a sweater.